This weekend was the Easter weekend for us orthodox, and we decided to try something new for a change. 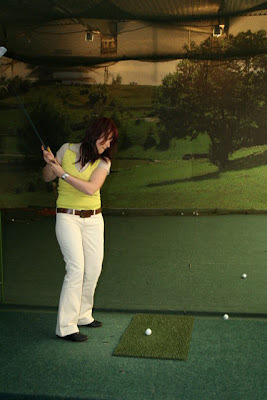 We went to "Lac de verde", that is an amazing golf course (one of the first in Romania), to learn how to golf. For our disappointment, we were not allowed on the golf course (you have to have at least 3 indoor hours to be allowed on the field), but it was a nice learning hour. We practiced indoor, throwing balls into a wide net. We learn about clubs, position, and oh! golf clothes. 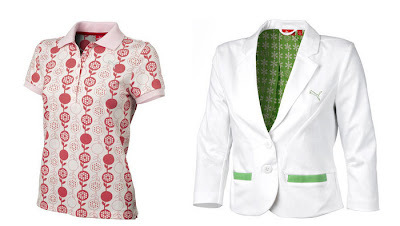 Arriving home i started to look online for cute and chic golf clothes. My first destination was the Stella McCartney for Adidas golf collection (I've received a press release about it just a week before). I like the leather golf gloves (but they don't have them at the Adidas i went to check), and also the general eazyness of the clothes. The tones are soft, natural, and the silhouettes are elegant, but sporty. Stella herself declared that she made this collection for the playing women that enjoy reflecting their own elegant style on the field. Then, the next virtual stop was Puma's website. Just one day before the golf trip, and, for buying a pair of Alexander McQueen shoes, i received a free gift part of a special promotion in the store: a yellow and pink Puma Golf vest (which i of course wear at my golf course). Contrasting with the Adidas collection, Puma propose happy colors and cute comfy golf clothes. Pink, fresh green and blue are the main colors, combined with white for a great look, contrasting the green of a golf field. I can't decide which of the styles above i like best, but if i will become serious about this game (we plan another trip at the golf field as soon as possible) i definitely should buy appropriate clothes. i really enjoy your blog, so i am adding you to my fav.